I'm doing a little guest room refresh for my mother here in Florida and I was shocked by how much I grabbed during one trip to target. I paired this quilt and shams with these sheets for a little print mixing fun. I also grabbed this solid cotton blanket in white for extra warmth. 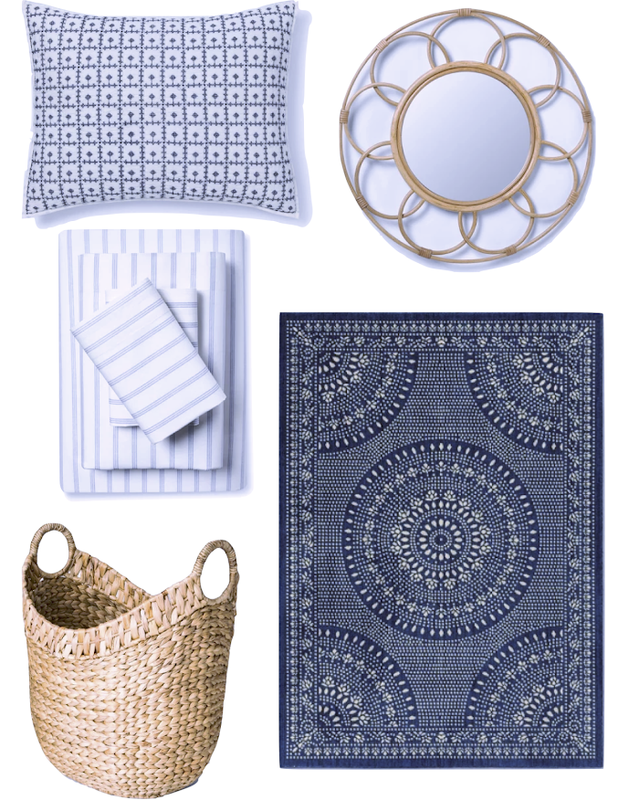 Rattan accents, because- obviously! Laundry is contained nicely in this oval basket, and the size of this mirror isn't too large so it works nicely. We also grabbed this jute rug for a steal! The quality is great I can recommend it with confidence (not from Target). This rug was a gamble- it was going to be perfect, or a little tacky. Luckily, we found it to be perfect for another space in the house. Very impressed with it! ** I really wanted this striped gauze blanket but didn't "need" it. Am considering it for my own bed this summer though. The material is so soft! !